Anchor historian Dave Burkhart looks beyond the sinners to the saints associated with brewing. When the saints go mashing in! St. Nicholas (on the far wall) has watched over the Anchor brewhouse for over 50 years. For visitors to Anchor Brewing, the most obvious occupants of its brewhouse are its gleaming copper vessels—mash tun, lauter tun, and brewkettle—its foaming copper grant, and its brewers in white coveralls, calmly, deftly, and artfully managing several brews at once on their six-hour trek from mash tun to fermenter. Watching over all this equipment and activity is one man. He has been watching over Anchor’s brewhouse for over half a century. He’s an older gentleman with a white beard, flowing red robe, and bare feet. His name is Nicholas, patron saint of brewers. 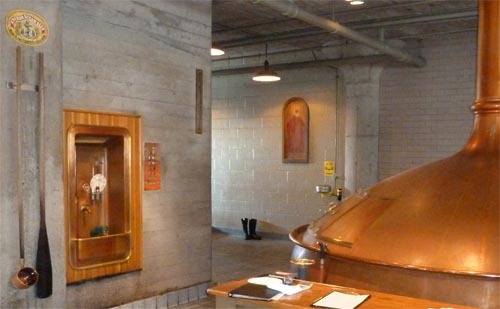 As long as anyone can remember, Dave Lyon’s portrait of St. Nicholas has hung in our brewhouse. Brewmaster Emeritus Mark Carpenter, who’s been with Anchor since 1971, remembers the painting from the old brewhouse on 8th Street. And Fritz Maytag remembers first seeing it on that historic day in 1965 when he visited the Brewery for the first time. 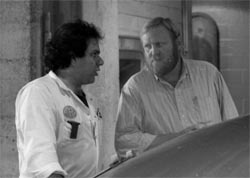 St. Nicholas looking over the shoulders of Bruce Joseph (left) and Bob Brewer (right) sometime in the 1980s. 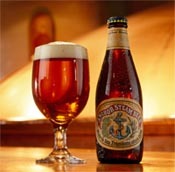 In the early 1960s, Anchor, then known as Steam Beer Brewing Company, was owned by Marin-ite Lawrence Steese. “The brewery was tiny in those days,” Fritz Maytag recalls. “It had only one employee and he didn’t have much to do!” The employee was Dave Lyon, who delivered kegs. But he didn’t have to lift very many, for twenty-five kegs was a big week at the Brewery in those days. Fritz Maytag recalls that every week, seven or eight of those kegs (15.5 gallons each) went to Fred Kuh’s Old Spaghetti Factory, “almost single-handedly keeping the brewery alive.” It was Fred who first told Fritz about the Brewery’s financial woes. Big Dave was well read and able to expound on virtually any subject from Aeschylus and Aristotle to Zeus and Zymurgy. And he was a talented artist. 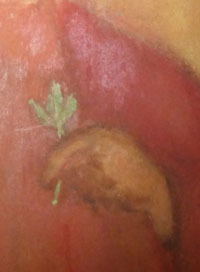 His painting of St. Nicholas is a colorful, charming, and cherished part of Anchor’s rich history. St. Nicholas was born around 270 A.D., in a small town on the southern coast of what is now Turkey. Orphaned at a young age, he devoted his wealth and energies toward helping those less fortunate. Around 300 A.D., he was appointed bishop of nearby Myra, now the town of Demre, Turkey. At one time a famine prevailed in his diocese, and when he heard that ships were in the port of Myra laden with wheat, he requested the captains that they should give him a hundred hogsheads of wheat out of each vessel. But they dared not do this, for the grain was measured at Alexandria and would be again measured at Constantinople where they were to deliver it. Then Nicholas said that if they obeyed him it should happen by the grace of God that their cargoes should not be diminished. So they complied, and when they were arrived at the granary of the emperor they found as much wheat in their ships as when they left Alexandria. And moreover that which they gave St. Nicholas was miraculously increased; for he fed the people so that they had enough to eat, and still sufficient remained to sow their fields for the next year. – A Handbook of Legendary and Mythological Art, Clara Erskine Clement (1881). An Asiatic gentleman sending his two sons to Athens for education, ordered them to wait on the bishop for his benediction. On arriving at Myra with their baggage they took up their lodging at an inn, purposing, as it was late in the day, to defer their visit till the morrow; but in the meantime the innkeeper, to secure their effects to himself, killed the young gentlemen, cut them into pieces, salted them, and intended to sell them for pickled pork. St. Nicholas being favoured with a sight of these proceedings in a vision, went to the inn, and reproached the cruel landlord for his crime, who immediately confessing it, entreated the Saint to pray to heaven for his pardon. The Bishop moved by his confession and contrition, besought forgiveness for him, and supplicated restoration of life to the children. He had scarcely finished when the pieces re-united, and the animated youths threw themselves from the brine-tub at the Bishop’s feet; he raised them up and exhorted them to return thanks to God alone, gave them good advice for the future, bestowed his blessing on them, and sent them to Athens with great joy to prosecute their studies. – Ancient Mysteries Described, William Hone (1823). St. Nicholas, of course, has for centuries been associated with Christmas and Santa Claus. One reason is rooted in Nicholas’s anonymous gifts of gold for the dowries of three impoverished sisters. Well-thrown by Nicholas through an open window, the coins apparently landed in stockings hung by the fire! Nicholas is believed to have died on December 6, 343, which is now his Feast Day, so our depiction of him with a sprig of hops is more poetically than chronologically appropriate. Buried in Myra, his relics were taken to Bari, Italy in 1087, where they remain today. It is not known with any certainty why or how he became a patron saint of brewers. But at Anchor, thanks to Dave Lyon, we have adopted Nicholas as our own patron saint, with joy and thanks that his painting, like our brewery, has been around so long! Cheers! Merry Christmas and Happy Holidays! That was a wonderful read and I really like the painting as well! His style is reminiscent of the medieval style.